Source: Tombstone of P.C. 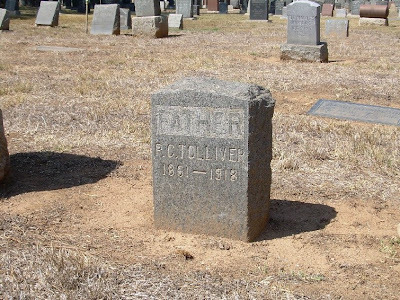 Tolliver, Evergreen Cemetery, Los Angeles, Los Angeles Co., California. Digital photograph taken by "Guardian," Find A Grave photo volunteer, at the request of Miriam Robbins Midkiff. 11 September 2006. Digital copy in the possession of Miriam Robbins Midkiff, Spokane, Washington. 2006. Clark Pleasant TOLLIVER...or was it Pleasant Clark TOLLIVER?...was my ex-husband's great-great-grandfather, born 25 May 1861 in North Carolina, probably in or near Glade Creek, Allegheny County. His parents were Jacob F. TOLIVER (1831 - 1898), a Civil War veteran, and Matilda HIGGINS (1829 - 1906). Clark had two older siblings (Amanda Phidella and Rose Phidella) and two younger siblings (Solomon and John Houston) before his parents divorced sometime before 1882. That was a time when divorce was not as common nor easy to obtain as it is today, and I hope to someday obtain a copy of their court records to discover more about that situation. In 1882, Clark's father remarried to Caroline CHEEK (1849 - 1927), with whom he had one known son, Clayton. Clark was a young man by this time, and not long after, he removed to Battle Creek, Madison Co., Nebraska, where he met and married Senna "Senie" COLLINS (1870 - 1950) on 3 July 1886. The couple had five children while they lived in Nebraska: a child who died young; Margie Ethel (my ex-husband's great-grandmother, whom he remembers well); John Houston; Zada Elizabeth; and Emma Leah. The family then moved further west to Hotchkiss Twp., Delta Co., Colorado, where they had four more children: Mae; Mitchell Luther; Elsie (who died in infancy); and Lorna Ermine. It was in Delta County that they met the MIDKIFF family. Margie married a widower in 1907, John Franklin MIDKIFF, who had four older children, including Edna Susan, whom Mitchell married 13 years later in California. Thus there were Midkiff and Tolliver cousins who were doubly related: first cousins on the Tollier side of the family and half-nieces and nephews on the other. Sometime before 1915, Clark and Senie moved once again, this time to Los Angeles. Clark died there 22 May 1918. Senie lived until 1950. They are buried in separate cemeteries: Clark at Evergreen and Senie at Forest Lawn in Glendale. WOW! Thanks to the great publicity over at facebook's Genea-Bloggers Group, we had the Best Scanfest Ever. We had three records broken! The first was a total attendance of 20, which means that in all, 20 Scanfesters participated at some point between 11 AM and 2 PM, PDT, but not all at the same time. The second was the highest number of Scanfesters in the chat conversation at once, at 18. The third record was the highest number of first-time Scanfesters in attendance: 11! My only regret was that I did not get as much scanned as anticipated because my hard drive was filling up (I've since been working on remedying that problem by deleting unnecessary files and programs). So who were our participants? Besides your humble hostess, we had Colleen, Diana, Diane, Elizabeth, footnoteMaven, George, George, Jasia, Kathryn, Kathryn, Kathy, Laura, Lori, Lorine, Michelle, Randy, Renee, Sheri, and Thomas! Too bad Craig couldn't make it! Thanks to Diane, Thomas, Randy, Kathy, and George for your announcements or follow-up posts on Scanfest, too. Speaking of scanning, Lee at the Footnote Blog shares how you can store your photos online for free at Footnote...and do a whole lot more with them, too! Find A Grave now has 25 million grave records in the non-famous side of their website! Take a look...you might find an ancestor or two. The Facebook craze has hit the genealogy community, thanks to Megan Smolenyak Smolenyak's Unclaimed Persons project. A side effect of this is a new Facebook group, the Genea-Bloggers, started by Thomas MacEntee of Destination: Austin Family. This group is for those who either blog about genealogy, or are fans of genealogy blogs. Genealogy bloggers have been learning more about each other in this terrific social networking community, and thanks to Thomas' great administrative skills, we're kept up-to-date on all sorts of blogging and other events, such as carnivals and Scanfest. Thomas recently started the Facebook® Bootcamp for Genea-Bloggers blog to help out those genea-bloggers learn how to navigate and use Facebook. I encourage you to join Facebook (a social networking site, similar to MySpace, but a little more "grown up") and add me as your Friend (contact) by searching for "Miriam Robbins Midkiff." (Don't be afraid to challenge me to a round or two of Scramble!) Besides adding genealogy community contacts, I've added real-life friends, family members, members of my local genealogical society and acquaintances from church and schools I've attended. I also recently searched for and found some cousins I've been out of touch with for years. And if you're already a member of the Genea-Bloggers Group, stay tuned to the FB for GB blog to hear of an exciting new event coming in August! 2. Four of them must followers of your blog. My primary heritages are Dutch and Frisian, and thus I've been a fan of Henk van Kampen's Trace Your Dutch Roots. Lately, he's been featuring photographs of Dutch ports. Do you have Mayflower ancestors? Take a look at the Delfshaven pictures. Did your ancestors (Dutch or not) traverse the Atlantic on one of the Holland-American Line ships? See the Wilhelminakade. The Frisians are an ethnic minority who live in present-day Netherlands, Denmark, and Germany, whose language, customs, and ethnicity are more closely related to the English than the Germanic peoples of the countries wherein they reside. I blog often about my Frisian ancestors from the Netherlands, and if you're a fan of Michael John Neill's RootDig, you'll hear about his Ostfrisians (West Frisians from Germany). Recently, Jennifer of Our Future Rooted in Our Past blogged about the North Frisian Emigrant - Archive of the Nordfriisk Institute in Denmark. Thanks for sharing this great resource, Jennifer! My parents returned home in the wee hours of this morning after a trip back to Michigan to visit my paternal grandmother, who was diagnosed about a year or so ago with Alzheimer's. As well, they enjoyed visiting the families of their respective brothers and one of Dad's sisters. I was relieved to hear that Grandma recognized Dad and Mom and that they had an enjoyable time together. My parents have made similar trips in the past to say their last goodbyes to their parents. Grandma is my last biological grandparent, although my mother's step-mother is still in good health. They also got to see one of the newest members of the family. I know this was a bittersweet time for the folks...a part of the circle of life. And finally! I received the latest issue of Internet Genealogy magazine today (I think I was the last person on the planet to do so!). One of the many reasons I love this publication is that I see so many familiar names, sites, and blogs mentioned. footnoteMaven's Shades of the Departed blog was featured in the Net Notes column by Donna Pointkouski. If you're interested in the photography side of genealogy (and who isn't? ), be sure to read this article, then drop by Maven's blog. Donna Potter Phillips of the Eastern Washington Genealogical Society has two articles. One is "E.W.G.S. at 75: Thriving' and Survivin'" and highlights the many ways our terrific society has kept up with the times and has stayed growing and vibrant in an age when we're seeing a demise of many societies. Her "Cold Case Research: Genealogy Style" reminds me of the Campbell House and Unclaimed Persons projects, and explains how doing family tree research on strangers from history is not only fun, but educational! If you're stuck or tired of your own family lines, why don't you and some genealogy friends or fellow society members do a similar project? Jillian Faith Burns was born 28 July 2008 in Grand Rapids, Kent Co., Michigan to my cousin Joy and her husband Joseph. She weighed 7 lbs., 5 oz. Little Jillian joins big brothers Joshua and Jarrod. Mother and baby are doing well. Joy was named after me (that's my middle name), and Jillian is named after my mother (Faith), who got to hold her a few hours after birth (my parents have been visiting family in Michigan this week). This makes grandchild number five and granddaughter number one for my uncle and aunt. "Looking into the Heart of Ireland" is the title of the 7th Edition of the Carnival of Irish Heritage & Culture. Lisa of Small-leaved Shamrock presented us with a Summer Reading Challenge, and if my count is correct, eleven bloggers shared 14 posts on a variety of literature relating to Ireland: fiction, poetry, genealogy, memoirs, history and juvenile literature (my submission is "The Long March"). Lisa did a fabulous job (as always), and arranged the posts into different genres, each illustrated with lovely old-fashioned pen and ink drawings and Irish quotes. She also recommended other books and online articles to complete the theme. Set some goals for the new school year and share them with us, whether you've begun working on them or not. Hopefully we will all inspire each other in our quest for Irish family history and in our attempts to make the culture of Ireland more a part of our lives. Deadlines for submissions are Monday, September 22nd, and can be entered here. Go enjoy reading the latest carnival, and get busy with your ideas for the next one! I'm writing this post because I expect to have a lot of new visitors within the next few days. With the large number of genealogy bloggers jumping on board Facebook and adding me to their friends list, the Showcase Your Blog event at Successful Blog, and my interview (online article here; hard copy to be published July 27th in the business section) by technology columnist Tom Sowa of the Spokesman-Review (Spokane, Washington), with a link to this blog, I am sure there will be a number of people asking, "so what's this all about?" Welcome! I'm happy to share with you some things about genealogy, this blog, and myself. AnceStories (ann-SESS-tore-ees) was a word I coined combining "ancestors" and "stories." I wanted a place online where I could publish the wonderful stories that my ancestors' lives had written in time and history. I started out with a website, because as I researched my ancestors' lives, I would come up with additional or corrected information to what I already had. Publishing their biographies in book format would not be convenient or current for long. For the most part, the term "genealogy" is a reference to the research process of discovering who your ancestors are (names, dates, locations) as far back as you can go in time. "Family history" is putting your ancestors into context with the history of their times, the society in which they lived, and adding personality and depth from small clues you uncover in photographs, letters they've written, or the memories they left behind in the minds and hearts of their descendants. So why am I so crazy about family history? I think it came out of a hunger to know more about my family and heritage, since I grew up in Native American communities in Southeast Alaska, where I was one of the few white children in those villages. My parents appreciated the diverse cultural education I was getting, but wanted me to understand my own heritage. They started buying me children's books on the Netherlands and incorporating Dutch holidays into our family celebrations. Even when we moved to Washington State when I was 12, we were still 2,000 miles away from my extended family. I've also always loved puzzles and mysteries; some of my favorite childhood books were the Trixie Belden mystery series. Family history and genealogy are like a huge, living puzzle. You have bits of information here, and snippets of facts there, and you have to put them together to see the big picture! In case you don't already know, "blog" stands for "web log", a journal, diary, or log kept online. It can be kept private, or made public like this one. The advantages of a blog over a website are several. It's quicker and easier to change or add information on a blog than on a website; Google indexes blogs--especially those on Blogger--daily to make it easier for other relatives to find you; and you can keep in contact with your readers when they leave comments on your posts (articles). I do write a lot about my ancestors' lives. One of my regular features is Wordless Wednesday, in which I post just a photograph of an ancestor or relative of my husband or myself. The following day, I write a biographical sketch on that person. When I come across a great genealogy database, or a keyboard shortcut, or some sort of research technique that's especially useful in genealogy, I feature it in a post. I publish press releases from various genealogy websites (subscription and free-for-use). Sometimes I write a review on a book about genealogy or history. I try to highlight what's happening in the genealogy world, either globally, nationally, or locally (I also blog for my local genealogical society here). Things I love to share are my successes: when I finally discover the names of an ancestor's parents or a document that proves a theory I had about something in their lives. These can be motivational, or even give research tips, to others with similar brick walls. I participate in a lot of carnivals, too. A blog carnival can be thought of as a magazine with every article written by different authors on a specific topic. All the articles can be found on each individual author's blog, with the carnival host listing the table of contents and links to all the specific articles at his or her own blog. The carnivals I've participated in are the Carnival of Genealogy, the Carnival of Central and East European Genealogy, the Carnival of Irish Heritage and Culture, the "Where Were You?" Carnival, the "I Smile for the Camera" Carnival, and the Cabinet of Curiosities. These carnivals give me an opportunity to focus on a particular topic and highlight something about which I may not have otherwise written. If you decide that you like this blog (! ), you can choose to either bookmark it, have each post e-mailed to you, or have the feed sent to your favorite feed reader (Bloglines, Google Reader, etc. ), by using the appropriate tools in the top right hand margin. Take a look at all the goodies in both margins...they go all the way down on both sides (you'll see I write for more than one blog). It's a "busy" look, I know. I'm trying to pair it down to make it a little easier on the eyes. I host Scanfest nearly every last Sunday of the month. It's a time when family historians gather online to chat while they scan their precious family photos and documents. Why? Because scanning can be b..o..r..i..n..g! Chatting helps the time go by quickly, we get to know one another better, and by having a scheduled time to do our scanning, we actually get to it, instead of putting it off. Feel free to join us this Sunday! I'm enjoying being on Facebook and interacting with other genealogists and bloggers there, as well as connecting with friends and relatives from my offline world. There's a huge genealogy community on Facebook, thanks to Megan Smolenyak Smolenyak's Unclaimed Persons project (and no, I did not stutter when I wrote her name!). I teach Online Genealogy classes--in person--for the Community Colleges of Spokane and the Spokane County Library District. I also teach some members-only computer classes for the Eastern Washington Genealogical Society, and I speak to various genealogical groups in the Inland Northwest. If you would like to take one of my classes or have me speak or give a presentation to your group, please e-mail me at kidmiffATgmailDOTcom. I am married and we are the parents of two high-school teenagers that make our lives "interesting," to say the least. We own a 100-year-old home that we are restoring whenever we have the odd hundred dollars or the occasional dozen hours to invest (we've notice that the two rarely coincide). We in turn are owned by a playful, slightly paranoid domestic tabby. I work as support staff for special education at the middle school level in my local school district. The 2008 - 2009 school year will be my ninth year working with students of varying disabilities, which have included mental retardation, cerebral palsy, traumatic brain injury, spinal bifida, fetal alcohol syndrome, Down's Syndrome, Asperger's Syndrome and autism. Children and young adults with autism are my favorite group of the disabled community to work with, because autism is such a challenge. Did I mention before that I like puzzles? :-) Once you find "the" key to working with a student, a wonderful bond exists that brings great joy to daily work life. I consider myself very privileged to work with these students and blessed with a fabulous group of co-workers. Away from my computer, I enjoy needlework (all kinds, but especially crochet and cross-stitch), reading, and walking. I'm not much of a TV watcher, but love black-and-white classic movies and old television shows on DVD. Classical, big band, country, and '80s pop are favorite music. Thanks for taking the time to read this very long post. I hope that you will want to visit again. Feel free to leave your comments below. Thanks to the social networking on Facebook, as well as word-of-mouth, it looks like this Sunday's Scanfest could be the biggest yet! If you are planning to attend Scanfest for the first time, please follow these steps BEFORE Sunday to make your experience go more smoothly, and so that I will not be spending the first hour or so getting everyone set up, and can do some scanning myself! 1. You need to have Windows Live Messenger downloaded to your computer. Mac users, use this link. 2. Windows Live Messenger works best with Hotmail or Gmail accounts. I don't know why, it just does. I recommend Gmail, because it has such good spam filters. 3. Send me an e-mail (kidmiffATgmailDOTcom) to let me know you've gotten all set up with Windows Live Messenger, so I can add you to my list of contacts. Check your e-mail account (the one that you will be using as a sign-in for Windows Live Messenger) to see if I have verified you and invited you to Scanfest. 4. Go to Sally Jacob's website here to sign up for her free newsletter. It will enable you to download her helpful information called 8 Blunders People Make When They Scan Photographs...and How You Can Avoid Them All. You do not want to be scanning photos as .jpeg files or at 150 dpi (dots per inch)! Sally's pamphlet will explain all! 5. Take some time to figure out what you want to scan before Sunday. Otherwise, you'll spend your time sorting and not scanning. UPDATE: On Sunday, sign in to Windows Live Messenger, and if you've done Step 3, you'll see my icon lit up on your list of contacts. Click on my icon and send me a message. I'll add you to our group conversation. We really look forward to meeting all the new Scanfesters, and hope your time will be used well, both in accomplishing some much-needed tasks, and getting to know other family historians! See you Sunday (11:00 AM - 2:00 PM, Pacific Daylight Time - you can attend at any time during these three hours). When Lisa put forth the Summer Reading Challenge as a topic for the 7th Edition of the Carnival of Irish Heritage and Culture, I pondered what to submit. First I thought of my favorite Irish author, Maeve Binchy, whose novels make terrific summer reads (or good winter ones, wrapped up in an afghan with a hot drink nearby!). Trouble is, I've read all her books available in the U.S., and her latest won't be published over here until 2009. Besides, I wanted something a little more pertinent to a genealogy topic. I remembered my favorite quote by Irish poet William Butler Yeats: "Education is not the filling of a bucket, but the lighting of a fire." (I can correlate that to the genealogy vs. family history issue.) But I'm not a big reader of Yeats, so that was no good, either. Aha! My mind flew back to when I was a homeschooling mom, over nine years ago (was it really that long?! ), and I had found some interesting recommended books while teaching a Social Studies unit on Native Americans to my then second-grade daughter. One in particular was given high praise no matter in what resource it was listed: The Long March: the Choctaw's Gift to Irish Famine Relief by Marie-Louise Fitzpatrick (Hillsboro, Oregon: Beyond Words Pub., 1998). It is a creative non-fiction work about a young Choctaw boy, Choona, who overhears his elders discuss taking up a collection to help the starving Irish during the potato famine. Choona knows, even though the adults do not speak of it, that his family endured hardship and suffering during the Trail of Tears and wonders how they can possibly want to aid white people, who live so far away. This incredible true story was beautifully illustrated by the author using as models the family members of Gary Whitedeer, himself an award-winning artist and historic preservationist who has been featured on TBS's The Native Americans and National Geographic's When Ireland Starved. The impoverished Choctaw nation raised $170 (equivalent to $5,000 today) to aid the Irish cause. If you have children in your life--and even if you don't--you will want to obtain this book. It is an emotional experience, and I dare you to read it without shedding a tear or two! The book was named "A Smithsonian Notable Book for Children" in 1998 and won the Children's Books of Ireland BISTO Book of the Year Merit Award, 1999. But there's more to all this. In 1992, eight native Irish citizens retraced the steps of the 500-mile Trail of Tears as repayment for the Choctaw's great gift, and to raise awareness of famine relief in Somalia. In 1995, the President of Ireland, Mary Robinson, visited the Choctaw Nation to personally thank them. Two great nations, both knowing suffering and starvation, are bonded at a deeply emotional and spritual level. It is a heritage of which anyone would be proud. I thought I would summarize my findings for the past week. There were some amazing discoveries online from a variety of websites and databases. Last week's Wordless Wednesday featured the marriage certificate of my husband's maternal grandparents. 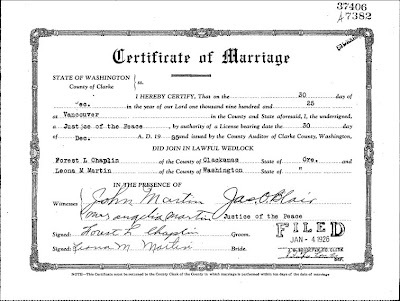 This week, I found three marriage certificates for his grandmother's twin brother, Lee Joseph "Mick"MARTIN, at the Washington State Digital Archives website. The fact that he had been married three times wasn't news to me, and I had the women's names, but these records gave me marriage dates and locations, full names of the women, and a previous marriage for his third wife. Also, an older MARTIN brother, Steven Charles, was a witness at two of the weddings, as well as "Mrs. Steve MARTIN." Steve himself was married three times (one marriage was to a sister of Mick's second wife), and I had hoped to find his marriage records in the WSDA as well, but no luck (not all the counties have had all available marriage records uploaded to the database yet). I've looked in other online marriage indexes for other Western states for Steve, without success so far. But I was very happy to find this information on Mick! Remember Alice Teddy, the rollerskating bear? The same gentleman, Michael Kirchmeier, who sent me her amazing photograph has been sending me tidbits, now and again, from newspapers from Cottonwood Co., Minnesota about my ROBBINS ancestors and CRAPSEY relatives. A while ago, he had sent me the news articles of how my 3rd-great-grandfather, Charles H. ROBBINS, had his hand crushed in a hay press in February 1880. This week, he sent me an article describing the proprietor's hay press establishment, and Charles is listed as an overseer. Mr. Kirchmeier speculates that my ancestor was given the job as overseer because of his injury in that hay press, which is probably true. The article was written in January 1881, and ran several times in subsequent issues. (It reminds me of the articles that Lidian features on her blog!) It also establishes that my ROBBINS family did not return to Michigan until after February 1881. I'm also happy to report that Michael Kirchmeier, who started out working as a historian by avocation, has recently become the director of the Jackson County Historical Society in Lakefield, Minnesota. Congratulations! As you may have heard, Ancestry released the 1891 Canadian Census this week, available to its Canadian or World Deluxe members. I've been attempting for some time to find information that will give me parents' names for my brickwall ancestors, Mary (TERRY or LAMOREAUX) and Richard WILKINSON, who lived in Whitchurch Twp, York County, Ontario in 1871 and 1881. Early last year, I found Mary's death record, but I have been unsuccessful in finding Richard's so far. The Ontario Cemetery Finding Aid has not been helpful, either. I did find Mary living with her widowed daughter and married grandson and his household in Markham Twp., York County, as well as finding all three of the other known children of Mary and Richard still living in Canada (son John, my ancestor, was in Michigan). These records established certain facts for me, including narrowing Richard's and son-in-law John GILLIAN's death dates to the 1881 - 1891 range, stating Mary's parents were born in Nova Scotia, and providing two more names of children of son William. In honor of the 100th anniversary of the FBI, Footnote this week released the FBI Case Files collection from the subscription area to the public area; translation: free access! Descriptions of the records of these files can be found here. I had been reading some other genea-blogs and noticed a reference to the Old German Files, 1915-20. Wait a minute! I had a German immigrant ancestor who lived in Michigan during those years. Could he have had an FBI file? BINGO! This was not only my best Find of the week, but one of my Best. Finds. Ever. My poor great-great-grandfather, John D. HOLST, had had to fill out an "Application for Exception from Classification of Enemy Alien." This could only have been slightly less humiliating than filling out his registration as an Enemy Alien in 1917. A man who had been a hard-working farmer and involved member of his communities for 35 years was suddenly looked upon with fear and contempt. His request to finalize his naturalization process had been postponed. Fortunately, he had residents of his community who agreed to vouch for his character, including the village doctor. I realize that John's experience was no different--and perhaps less intimidating--than those of thousands of Germans, and later Italians and Japanese--during our country's involvement in the World Wars, and those of certain political affiliations during the Cold War. These continue today in the American communities of Middle Eastern immigrants. The bonus side of my ancestor's experience was that it created paperwork that has given me information on him and his wife that I had been unable to find thus far: a photograph; his signature (multiple times); his middle name; his complete date of birth; his wife's middle name; her specific birthplace in Sweden; the fact that he had a sister; his sister's married name and address. This is only the tip of the iceberg; there is much more information in these seven pages of documents, but most of it I have discovered elsewhere. My one regret is that in the area where he was to fill out information on his parents, he simply lists "Deceased." If you have an ancestor--especially an immigrant one--who came from a WWI-era enemy country, you need to check out this database! Source: Valk, Trijntje Gerrits Dolstra. Photograph. Bef. 1888. Original photograph believed to be in the possession of John Heidema, Little Silver, New Jersey, 2008. 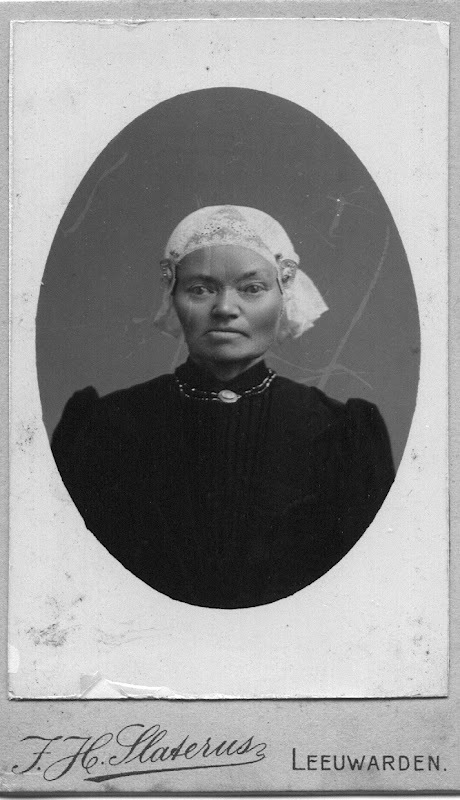 My 4th-great-grandmother and immigrant ancestor, Trijntje "Katherine" Gerrits DOLSTRA was born 8 November 1826 in the municipality (similar to a township) of Ferwerderadeel, the province of Friesland, the Netherlands. Her parents were Gerrit Hendriks DOLSTRA and Willemke Gerryts ENBRENGHOF, and it is likely she was born in the village of Marrum where her parents were married twenty years earlier. I know more about Trijntje's (TRINT-yah) mother Willemke's family than her family of her father Gerrit DOLSTRA. Willemke's father was Jan Gerryt Martens ENGBRENGHOF, and he had been born in 1755 in Burgsteinfurt, Westfalen in what is now Germany. He immigrated to Friesland between 1774 and 1778. It is possible that his immigration was motivated by religious reasons, as the Netherlands was religiously tolerant and a haven for the persecuted (think of the Pilgrims). We know that Jan was a member of the Evangelist church before he left Westfalen, too. In Marrum, he opened a shop and became a master linen weaver. He married Trijntje HESSELS (1762 - bef. 1811) on 29 Aug 1779 in Marrum. She was the daughter of Hessel Daniels van der PLOEG, a ship master, at a time when the Netherlands built the best ships (fishing and war) to sail the seven seas. It is this Trijntje for whom my Trijntje was indirectly named. Willemke was the fifth of eleven children, and she married Gerrit Hendriks DOLSTRA (c. 1782 - 1838), of whom we know so little, in Marrum on 29 June 1806. Apparently it was difficult for them to conceive children. Their first child, born in 1807, was named Trijntje (not my ancestor) after Willemke's mother. Eight long years followed before the birth of Grietje, named after Gerrit's mother. Then tragedy struck, and 18-year-old Trijntje died. Sixteen months later, my Trijntje was born. Her parents were 44 and 38 at the time of her birth, and her father Gerrit passed away when she was 12 years old. Willemke died five years later. It is likely that 17-year-old Trijntje and 22-year-old Grietje worked as domestics or laborers until Grietje's marriage six years later. In the village of Marrum was a young man by the name of Wieger Tjammes VALK, and he and Trijntje wed on 23 May 1857. Wieger was 29, Trijntje 30, not unusual ages for men and women to marry in the Netherlands at that time. A boy, Gerrit, was born 18 November 1858, but died the following January. Then twin boys were born on 24 Jun 1860 and were named Gerrit and Tjamme (T' YUH-muh) after their grandfathers. Life went on in the little village until the boys reached the fall of their 13th year, when Gerrit died. For a while, a nephew of Wieger, also named Tjamme, lived with them, and was enumerated in the Dutch national census in 1880 with the household. Not much further is know about the VALK family until Tjamme, at age 21, immigrated to the United States in 1882. With him was his fiancée, Berber Sjoerds DeJONG, whom he married that June in Rock Island, Rock Island Co., Illinois. Tjamme and Berber, who in America became known as James and Barbara, started a family. Their first four children were born in Rock Island but only the child that would become my great-grandfather, William, survived childhood. The family moved north and lived briefly in Holland, Ottawa Co., Michigan before moving again slightly east to Grand Rapids, in Kent County. By now it was 1888, and news must have reached them of Wieger's death. Trijntje was all alone; her sister had died in 1866 and her brother-in-law in 1873. There appears to be no nieces or nephews on that side of the family. Trijntje apparently wasn't close with her late husband's family, and James and Barbara must have urged her to come live with them in America. Before she left, she traveled to the nearest big city, Leeuwarden, the provincial capital, and had the above photograph taken in her native Frisian costume. Each area of the Netherlands has a traditional dress and experts can even distinguish between villages by the style of the ladies' caps. Trijntje became known as Katherine in Grand Rapids. She brought with her her Dutch Bible, in which she carefully wrote the birth and death dates of her grandchildren. We are so fortunate to have that Bible in existence, because in searching the vital records of Rock Island, I was only able to find a recording of one of the four children born there. Katherine had a long, hard life. She witnessed the death of many loved ones, including three grandchildren in Grand Rapids. She herself died of senile decay at the age of 85 on 19 May 1912 in James and Barbara's home in Walker Township, just west of the city. In the fall of 2000, I stood for the first time ever at an ancestral burial place and photographed the graves of Katherine, James and Barbara in Greenwood Cemetery. It was an emotional experience, and I could only feel gratitude that my ancestors had taken the risk to come to a land where they knew their descendants could have a better, richer life than they had had. I hope somehow they know how much I appreciate them and comprehend the sacrifices they made. 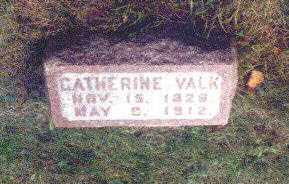 Source: Tombstone of Catherine Valk, Greenwood Cemetery, Walker Twp., Kent Co., Michigan. Photograph. October 2000. Original in the possession of Miriam Robbins Midkiff, Spokane, Washington. 2008. Approximately 46.3 million new records and 1.2 million new images are now available on the Record Search pilot at http://pilot.familysearch.org. This brings the total number of names available on the test site to 467,180,871. Two new Records Access projects (1841 & 1861 England Census collections) were published with links to images on findmypast.com. This is important because it tests the pilot search engine’s capacity to ingest third party indexes and link to images hosted on affiliates’ sites. Such functionality enables FamilySearch to better fulfill its goal to increase access to more genealogical records faster for its users and members. Recent Records Access news announcements can be found at FamilySearch.org. Featured in the July 26th Edition of Terry Thornton's "Harvest from the Blog Garden" at Hill Country of Monroe County, Mississippi. It's been a while since I've mentioned my journaling prompts over at my other blog, AnceStories2: Stories of Me for My Descendants. I've been posting prompts fairly regularly this summer, but have not been writing my responses. Last week's topic was "Summer," and this is something I've been wanting to write about for some time. *How do you feel about summer? Is it a favorite season, or do you prefer another? Summer is my second-favorite season, following fall. *What are your favorite summer activities? Do you enjoy being outside, or would you rather curl up with your air conditioner? I am not a fan of the heat...remember, I grew up in Alaska! So I tend to stay indoors a lot, or go out in the evening (the morning tends to aggravate my seasonal allergies). I do enjoy going out to the lakes round about here (Spokane: Near Nature, Near Perfect) because you get the glorious sunshine with a nice breeze and can jump in the water to cool off when you get too hot. When I was younger and worked at a summer camp, I loved to water ski. The last summer I skiied (22 years ago...yikes!) I learned to slalom, which was absolutely awesome! *Do you have a favorite summertime sport to participate in or watch? Occasionally, we will go to an Indians game. Our family is really not into sports. I do like watching all aspects of the Summer Olympics, and was disappointed that CJ Nuess did not make the Olympic swim team (his mother, a 1968 Olympian, is my supervisor). *What is your typical summer outfit? I tend to wear sleeveless tops (dressy or casual, dpending on the setting) and capris or longer shorts. I love going barefoot and wear flip-flops if I have to wear shoes. *Do you take a summer vacation? Where do you normally go, and what kinds of activities do you do there? We have two or three places we usually visit during the summer. The first is Deer Lake just west of here in Lincoln County, Washington, in the scabland country. It's desolate, semi-arid, and very beautiful in its unique way (here's an example). We tent camp with my children's father's family, usually for the weekend, although they tend to stay longer. It generally gets to 100*+ during the day and down into the 40s at night! There are rattlesnakes, cattle, and coyotes. It's like living in the Wild West! We have to tote in water and the only facilities are an outhouse. But it's a Midkiff tradition going back to when my children's paternal grandfather was a boy. I missed it this last weekend, because of genealogy computer classes and some commitments on my side of the family. The second place we go to is a resort at one of the Little Pend Oreille (pond duh RAY) Lakes up north in Stevens County. We rent a cabin and stay for about a week, usually in mid to late summer. Often my children's uncle's family also vacations with us. We have lots of good times and memories of practical jokes, water fights, and late night games of Balderdash! See pix here. My kids usually our kids go to Silverwood for the day with their youth group. We've gone as chaperones for school events and a couple of times my children's father's employer had company picnics there. Since they've added the waterpark, it's a lot more fun than just the great rides! *What is your favorite summer holiday, and why? I love the Fourth because we get to spend time with my parents at their beautiful log cabin up north. They always have a barbeque and extended family, plus half their church (it seems!) are invited. Then we come back to Spokane and watch the city fireworks show from the campus of Gonzaga University. *What kinds of summer foods or drinks do you enjoy? I love fresh berries and peaches, potato and green salads, and cold soft drinks. I also enjoy the occasional beer on a hot weekend evening on the front porch, just enjoying the quiet evening or sometimes visiting with neighbors. *Share some favorite memories of summer vacation from when you were a child. We didn't go anywhere on a summer vacation because we lived in Alaska far from family. We practically lived in one of the nation's largest national forest, so there wasn't much of a point in going camping, with wildlife literally all around us! The closest thing to a summer vacation we had was the trip we took after my parents sold their house in Alaska. They put everything in storage, kenneled our farm animals, and bought a camper and truck. We took a ferry from Prince of Wales Island, Alaska to Prince Rupert, British Columbia and drove down the coast of BC, Washington and Oregon, then came up the east side of Oregon and Washington. All the while we camped at campgrounds and looked for real estate. After finding their present home near Colville, Washington, we drove back to Michigan to visit family while the former homeowners moved out. On the way back to Washington, we stopped at DeSmet, South Dakota, the setting of many of Laura Ingalls Wilder's books. That was a memorable and fun summer! *What is your least favorite thing about summer? Heat. *Do you enjoy summer storms? I love them! When I was first married, I lived out on the West Plains and used to go out on our deck and watch the lightning shows. I've never been afraid of them. *What is the hottest summer temperature you remember experiencing? 116* in the shade at Deer Lake, 2005, I think. Ugh! *Do you have a memory of a cool or cold summer? Has it snowed on the Fourth of July in your area? It was awfully cool this year for a while. We had snow the morning of June 9th (yes, I realize it wasn't officially summer yet). It made up for it by having 100* temps two weeks later, very unusual for June. It usually rains here from just after Memorial Day to right around the Fourth, then gradually heats up to a sizzling hot August. *What family birthdays, anniversaries, or events are commemorated in the summer? Are there any significant family history events that occurred during summer? We have nine family birthdays, an anniversary (not mine), Father's Day, and graduations occurring in June. I'm about to force all the young married couples in the families to sign contracts agreeing that they will not give birth to any more children in June! I'm always broke then, and it's a good thing it comes halfway between Christmases! *What summertime hobbies do you pursue? If you are a genealogist, do you travel to ancestral locations during this season? I have more time to devote to blogging, research, and lookups during the summer. If I get a chance to travel and I come anywhere within 100 miles of my children's paternal ancestors' cemeteries, I try to swing by. All of my ancestral locations are back east (except for one cemetery in the Willamette Valley). *Do you have any summertime photos of your ancestors? Check out the 49th Edition of the Carnival of Genealogy ("Swimsuit Edition") for great stories and photos of genealogy bloggers' ancestors in swimsuits and summertime wear. I participated in that carnival and my entry is here. July 2008 Scanfest is Coming! Yep, it's almost Scanfest time! We're in that part of summer where it just starts going faster and faster, and before I know it, I'm preparing myself and my children for the next school year. I've got this big Rubbermaid tote full of photos and ephemera loaned to us by my father-in-law that is my summer scanning project, and I've barely touched it. Well, to be honest, I did some of the scanning over the winter and spring, but I was supposed to be finished by now. So my plan is to do a bunch of prep on what needs to be finished and see how much I can complete this Sunday. You'll need a Hotmail or Gmail account, and Windows Live Messenger downloaded to your computer (Mac users go here to download Microsoft Messenger for Mac). Although Windows Live Messenger states that it is compatible with Yahoo! e-mail accounts, we have had difficulty adding Yahoo! users to our chat conversation. If you don't already have a Hotmail or Gmail account, it's very easy (and free) to set one up. Just go to the links in the previous paragraph. Once you have gotten set up, send me an e-mail (my address is found on this page) and I'll add you to our chat list. You'll receive an invitation message from me at the e-mail address that you've set up for Messenger, and then you will need to verify that I can add you as a contact for Windows Live Messenger. Sunday, just sign in to Windows Live Messenger and look for me. I'll add you to our conversation! Ethan was born 10 July 2008 in Grand Rapids, Kent Co., Michigan to my cousin Mark and his wife Annette. He joins big brother Miles Danger--yes, danger IS his middle name! Mother and baby are doing well. This makes grandson number four for my uncle and aunt. Stay tuned as I will be announcing in the very near future grandchild number five/granddaughter number one! The other carnival was the 52nd Edition of the Carnival of Genealogy, whose topic was "Age." Lisa of 100 Years in America hosted this edition, which had 29 submissions by 28 bloggers. My post, "What's Age Got to Do with It? ", can be found here; but alas! apparently I was so excited about getting my post finished a day ahead of the due date (instead of the day of, as usual for me), that I forgot to submit it in time. Oh, well! Lisa was so kind to squeeze in my entry! By the way, "well done" to both Lisa and Jessica for all the work they did on their respective carnivals! The topics for both of these next carnivals will be a Carousel Theme, which means the bloggers may pick their own topic. The due date for the 10th Edition of Carnival of Central and European Genealogy is August 4th; submissions can be entered here. The due date for the 53rd Edition of the Carnival of Genealogy will be August 1 and you can enter your articles here. Now go enjoy some great reading! Source: Chaplin - Martin Certificate of Marriage. Washington. Clark County. Marriage Certificates 1889 - 1977. Digital image. Washington State Digitial Archives. http://www.digitalarchives.wa.gov/ : 2008. Yes, I realize that Wordless Wednesday is supposed to be about displaying a photograph, not a document. Inspired by George Geder's posts of posting ancestral photos on Wednesday and then a biographical sketch on Thursdays, I started doing WW back in February, based on a pattern of showing ancestral photos from my father-in-law's, father's, mother-in-law's, and mother's family trees, in that order. The problem was, I don't have access to many photos from my mother-in-law's family, and I don't believe she does, either. Unless I can come in contact with some of her relatives and obtain scans of ancestral photos (if there are any), I'm relegated to displaying photos of tombstones and images of documents. So be it! I did want to feature this document, however, for a variety of reasons. My husband's family (both parents' sides) has lived in this state since the early 1900s, and Washington State has a wonderful open-record policy, perhaps one of the best in the nation. In addition, the Washington State Digital Archives and FamilySearch Labs are featuring both indexes and images of county, state, and federal records for Washington residents. I'm waiting impatiently for FamilySearch to release the images that have been indexed on their pilot site, and decided to help them along by doing some indexing on that specific collection. That in itself has been a lot of fun...to see records from Stevens County (where my parents live), Spokane County (my residence), and Klickatat County (which we pass through on the way to visit my in-laws). I recognize all these little towns which certainly helps in determining messy handwritten locations on death certificates! Besides featuring a document with personal sentiment from the fabulous digital archives site, I thought this record was unique because it contains the signatures of four my husband's direct ancestors. John Franklin and Angelia Rebecca (LUKE) MARTIN were Leona Mary MARTIN's parents. Forest "Frank" L. CHAPLIN and Leona were my mother-in-law's parents. I've always seen Forest's name spelled with two Rs, but here he signs it with one. Hmm... I had the privilege of meeting the widowed Leona once--at our wedding--and then attended her funeral in 1993. I've mentioned Leona and her twin brother Lee before in one of my earlier Wordless Wednesdays. My longest-living known ancestor was William SAYERS, who was actually my 5th-great-grandfather (I'm keeping the rest of my statistics to the 4th-greats on down). He was born in 1758 in Letterkenny, County Donegal, Ireland, and immigrated with children and grandchildren around 1830 to Prince Edward Co., Ontario, Canada. He would have been around 72 years old when he traversed the North Atlantic in a wooden sailing vessel...amazing! We know his age at death in 1860 because a cousin who researched this line found mention of his great age in census records. This family line, which includes my WILKINSONs and LEWISes, had many descendants who lived into their late 80s and 90s. In fact, my great-great-grandfather, George Emmett LEWIS, a carpenter, built his last house when he was in his 90s. He fell off the roof he was shingling, but left the hospital "because they're for old people." He returned to his job and finished the house! When he died at the age of 96, he had 125 living descendants. I have eight ancestors within the recent seven generations who died in their 30s; of these, Ann Elizabeth ROCKWELL (died when her apron caught fire) and Nelson H. PECK (cause of death unknown) were the youngest, both dying at age 30. Four ancestral brides were only 14 when they married: Mary Jane BARBER; Marinda ROBBINS; Fannie MARBLE; and Mary Lucy WRIGHT. The youngest grooms--Angelo Merrick ROBBINS, Sr. , Benjamin Henry KIMBALL, and Martin HOEKSTRA--were 18; none of them married the 14-year-old brides! Martin's maternal grandparents, Filippus Willems JONKER (40) and wife Catharina Klaassens van der LAAN (22), had the greatest age difference: 18 years. And their daughter (Martin's mother), Grietje JONKER, with her husband Jan Martens HOEKSTRA were the oldest couple to marry, at 35 and 47 years old, respectively. It was a second marriage for them both. While these statistics may not be necessary for family history research, they do make it interesting! Have you looked at the ages of your ancestors or family members and found something amazing about them? Written for the 52nd Edition of the Carnival of Genealogy. One of my children's father s maternal 2nd-great-grandfathers was François Joseph MARTIN (c. 1828 - 1897), born in Strasbourg, Alsace, France, son of François MARTIN and Anna Eve ROUECHE. He emigrated to America before 1848, marrying Rachel HUBBY, of Scots and English ancestry, that year in Illinois. This line is probably the most recent and heaviest French line of all our children's ancestors. In another maternal line, my children have DeVERRE ancestry that came out of Louisiana into Kentucky by the early 1800s. It's probable that this is another French line. A 9th-great-grandfather on my father's side was Jacques CAUDEBEC who, according to family history, was born c. 1666 in Caudebec, Normandy, France. The village was likely Caudebec-en-Caux. Jacques emigrated to New York City, where he married a Dutch woman, Margaretta PROVOOST. If my family history is correct, both died at advanced ages in what is now Orange County, New York. On my mother's side, one of her lines that came out of the Province of Friesland, the Netherlands, was the RENEMA family. It is very likely that this surname is a French derivative (it literally means "of René"--not a Dutch name!) and may be a reference to a French Huguenot (Protestant) patriarch who may have left France for religiously tolerant Holland after the Edict of Fontainebleau. None of these lines produce much more than a drop in the bucket of our children's combined ancestry, which is mainly German, English, Dutch and Frisian, Norwegian and Scots. However, it is interesting to review, and perhaps someday I will do some active research on these families. "Celebrate Home" is the topic of the 3rd edition of the "I Smile for the Camera" Carnival, which footnoteMaven has created on her new blog, Shades of the Departed, a free digital publication which highlights photography and genealogy. My entry for this carnival was "Home is Where the Heart Is," and was joined by 19 others. There are beautiful photos, thoughtful Wordles (you'll have to read the posts to discover what that is! ), and heartwarming stories, all celebrating the ideal of Home. The deadline is midnight, 10 August 2008. Submissions may be entered here. Source: Lewis, Elenor "Nellie" Vreeland. Photograph. Date unknown. Original photograph in the possession of Jeanne Holst Robbins, Fulton, Texas. 2008. This photograph, within its oval oak frame and thick convex glass, adorned the walls of my paternal grandparents' living room in Coopersville, Ottawa Co., Michigan for many years, along with its mate, the photo of Nellie's husband, John Wallace LEWIS. Nellie was of the eighth generation of VREELANDs who had made North America their home. Her 5th-great-grandparents, Michiel Janszen VREELAND (1610 - c. 1663) and Sofitje HARTMANS (1611 - 1697) were immigrant ancestors from the Netherlands to the New Netherlands (present-day New York State and New Jersey). Perhaps you have a family line in which many of the men (or women) are given a certain first name, often to honor the patriarch of the family or an immigrant ancestor. In my SWEERS family line (unrelated to the people in this particular post), that name is Daniel; and in my VREELAND family line, it is Hartman. Nellie's 4th-great-grandfather, her 2nd-great-grandfather, her grandfather, a brother, and a son were all named Hartman, in honor of Sofitje HARTMANS VREELAND. (Hartman would also have been Sofitje's father's name; the patronym Hartmans literally means "Hartman's daughter.") The VREELAND family had lived all those generations in New Jersey until sometime between 1840 and 1843, when Nellie's parents, John P. VREELAND and Mary KANOUSE settled in York Twp., Washtenaw Co., Michigan. Besides brother Hartman, who was about a year younger than Nellie, there were older siblings John H., Elizabeth, and Sarah, and younger siblings George W., Mary Esther, and Martha A. VREELAND. 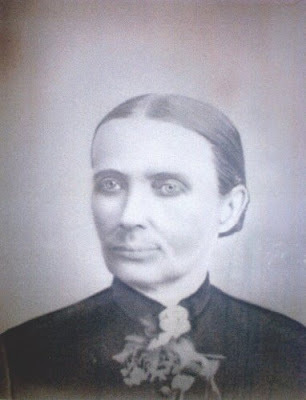 On 20 April 1867, Nellie married John Wallace LEWIS, a New York native who had come to Washtenaw County perhaps to start a new life, having been widowed, leaving his two young children in the care of his parents back in Oswego Co., New York. John and Nellie had seven children, although our family history only lists five: George Emmett (my great-grandfather); John Wallace, Jr.; Esther Mary "Ette"; Hartman (named for Nellie's brother); and Ida May LEWIS. It was when the 1880 U.S. Federal Census Index was released on CD by FamilySearch that I discovered two more children that remain elusive in our family history: Ethel and Willie. Ethel was born c. 1875 and Willie c. 1879, both in Michigan. Willie's age was listed as one year old, while Ida, known to have been born 11 February 1879, was shown as two years old--curious! I cannot find these two children in any birth, death, or burial records, and they don't appear again on federal census records (I have yet to search the 1884 and 1894 state censuses). In the 1900 U.S. Federal Census, Nellie states that had given birth to five children, five of whom were living. So who were Ethel and Willie? If they were adopted children (perhaps a niece, nephew, or cousins), I've still been unable to find their births listed under John and Nellie's siblings' names. The Lewis family lived in the Clinton and Washtenaw County area for quite a few years, and it appears to have been a back-and-forth migration. George (1868), Esther (1874) and Hartman (1876) were born in Clinton County, while John, Jr. (1870) was born in Washtenaw County, where his parents had married (1867). The family was in Washtenaw County in 1870 (federal census), but in Clinton County in 1874 (state census). Sometime between 1876 and 1879, the family relocated west to Muskegon County, where they farmed in Whitehall Township until the late 1880s, then moved to Blue Lake Township. There they stayed until at least 1900. John died 9 February 1908 in Whitehall Village, followed four months later by son John, Jr. Nellie probably went to live with married daughter Ida in Pontiac, Oakland Co., Michigan. She does not have a death record in Muskegon County, but is buried there in Oakhurst Cemetery, Whitehall Twp. with her husband and numerous descendants. Her gravestone reads "1835 - 1912." My goal is to get her death record and obituary. 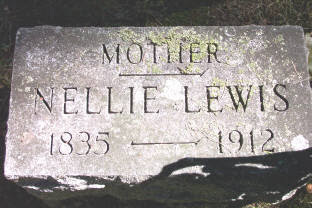 Source: Tombstone of Elenor L. "Nellie" (Vreeland) Lewis, Oakhurst Cemetery, Whitehall Twp., Michigan. Photograph taken at the request of Miriam Robbins Midkiff by Toni Falcon, volunteer for Random Acts of Genealogical Kindness. 2005. Wordle You Like to Know My Surnames?